Nûḥ ibn Lamech ibn Methuselah (Arabic: نوح‎, translit. Nūḥ‎), known as Noah in the Old Testament, is recognized in Islam as a prophet and apostle of God (Arabic: الله‎ Allāh). 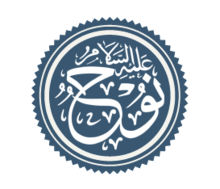 He is a highly important figure in Islamic tradition, as he is counted amongst the earliest prophets sent by God to mankind. According to Islam, Noah's mission was to save a wicked world, plunged in depravity and sin. God charged Noah with the duty of preaching to his people to make them abandon idolatry and to worship only the One Creator and to live good and pure lives. Although he preached the Message of God with immense zeal, his people refused to mend their ways, leading to his building of the Ark and the famous event of the Deluge, the Great Flood in which all the evil people of his time perished. The influence of Noah's preaching and prophet-hood spanned 950 years according to Quran. Little is known of Noah's personal history before his call to prophecy. However, the Qur'an records him to have been the son of Lamech and grandson of Methuselah, one of the patriarchs from the Generations of Adam. Noah was neither the leader of the tribe nor a very rich man but, even before being called to prophecy, he worshiped God faithfully and was, in the words of the Qur'an, "a devotee most grateful". For Muslims, Noah was married to a woman whose name is not mentioned in the Qu'ran. Some Islamic historians such as Al-Tabari have suggested that the name of Noah's wife was Umzrah bint Barakil but this cannot be confirmed. Most Muslims simply call her by her biblical name Naamah. Islamic scholars agree that Noah had four sons whose names were Ham, Shem, Yam and Japheth. 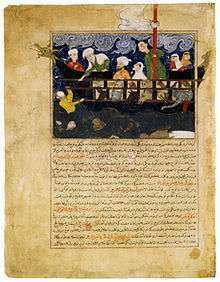 According to the Quran, one of Noah's sons was a disbeliever who refused to come aboard the Ark, instead preferring to climb a mountain, where he drowned. It is agreed among most Islamic scholars that Yam was the one who drowned; the other three remained believers. Islamic literature recounts that in the Generations of Adam, many men and women continued to follow Adam's original teachings, worshiping ALLAH (GOD) alone and remaining righteous. Among Adam's descendants there were many brave and pious men, greatly loved and revered by their respective communities. Exegesis goes on to narrate that, upon the death of these elders, people felt enormous grief and some felt prompted to make statues of these people in remembrance of them. Then, gradually, through the generations many forgot what such statues were for and began to worship them, (as the shaytan (satan) slowly deceived each generation) along with many other idols. In order to guide the people God appointed Noah with the duty of being the next prophet to humanity. Early on, a few were moved by Noah's words but the powerful and wealthy members of the tribe refused to hear his call. The unbelievers at the time were impelled to rebel by various evil motives. Firstly, they were extremely envious and jealous of men superior to them in any way. Secondly, the people were ignorant of the weak and lowly, who were frequently superior intellectually, morally and spiritually. As a result of their ignorance, they were arrogant and mocked all who they felt were inferior to them. 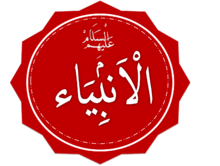 Saying,"Are we to believe you, when those who follow you are the most abject of people?" Noah responded: "Their judgment rests only with my Lord, if you could perceive." When Noah preached the faith of God to them, all they did was revile the messenger, abuse the message and call the whole warning a lie. He then went on to explain the Message in greater depth, ensuring them that it was not a message of destruction but it was a message with the mercy from God, and that their acts would lead to destruction if they did not accept the faith. He questioned them, asking why they would not accept what would benefit them in the near future. Noah went onto further, and told his community that he asked of no reward from them, telling them his only reward would be from God. But his people threatened him of being stoned. — Qur'an sura 37 (As-Saaffat) ayat 75-79"
The Qu'ran states that Noah was inspired by God, like other prophets such as Ibrāhīm (Abraham), Ismā'īl (Ishmael), Ishaq (Isaac), Ya'qub (Jacob), Isa (Jesus), Ilyas‘ (Elijah), Ayub (Job), Harun (Aaron), Yunus (Jonah), Daud (David) and Muhammad (Mohammed), and that he was a faithful messenger. Noah had firm belief in the oneness of God, and preached Islam (literally "submission," meaning submission to God). Many non-Middle-Eastern civilizations also have flood myths, and some have very similar stories containing characters who are very like Noah. Some have argued that these similarities are evidence that Noah actually existed, being called different names by different peoples. Others argue that civilizations must have borrowed details of Noah's life for their own Noah-types, or that they all spring from the same source. Yet others say that these Noah-like stories are completely unrelated. The Noah story of the Pentateuch is almost identical to a flood story contained in the Mesopotamian Epic of Gilgamesh, composed about 2500 BC. The few variations including the number of days of the deluge, the order of the birds, and the name of the mountain on which the ark rests. The flood story in Genesis 6–8 matches the Gilgamesh flood myth so closely that "few doubt that [it] derives from a Mesopotamian account." What is particularly noticeable is the way the Genesis flood story follows the Gilgamesh flood tale "point by point and in the same order", even when the story permits other alternatives. Utnapishtim, a character in The Epic of Gilgamesh, tells the story of a flood very similar to that of Noah. In this story, the gods are enraged by the noise that man has raised from the earth. To quiet them they decide to send a great flood to silence mankind. Various correlations between the stories of Noah and Utnapishtim (the flood, the construction of the ark, the salvation of animals, and the release of birds following the flood) have led to this story being seen as the inspiration for the story of Noah. However, his role in Gilgamesh is to provide the secret of everlasting life to the hero, who promptly falls asleep before Utnapishtim gives him the secret of life. A story involving Lord Vishnu and King Manu is found in the Hindu chronicle Matsya Purana. Lord Vishnu in his 'matsya' (fish) avatar ordered the virtuous king Manu to construct a huge boat with animal and plant specimens of all forms, to escape the Great Deluge, and finally when the water receded,the great boat was found atop the Malaya Mountains. Encyclopædia Britannica notes that "Manu combines the characteristics of the Hebrew Bible figures of Noah, who preserved life from extinction in a great flood, and Adam, the first man", which view is reflected in several other works. Indologist David Dean Shulman writes that borrowing between the myths of Manu and Noah "cannot be ruled out". For Krishna Mohan Banerjee, the names "Noah" and "Manu" "had the same etymological root: 'Manu' must have been the Indo-Aryan ideal of Noah." Philologist and founder of the Asiatic Society of Bengal, William Jones, "identifies Manu with Noah", along with whom, "the seven sages can be identified with the eight people aboard the Ark." Furthermore, researcher Klaus Klostermaier reports a Muslim writer who "identifies Brahma with Abraham .... and Manu with Noah." Others, however, would say that "the story is thoroughly Indian" and the "boat is not the equivalent of Noah's Ark, though it is still the symbol of salvation" According to Purana Manu's story occur before 28 chaturyuga in the present Manvantara which is the 7th Manvantara. This amounts to 120 million years ago. According to Bible, Noah was 9 generations after Adam (4004 BC – 3074 BC) which is about 3500 BC. ↑ chief, John L. Esposito, editor in (2004). The Oxford dictionary of Islam (Paperback. ed.). Oxford: Oxford University Press. p. 236. ISBN 9780195125597. ↑ "G. P. Bhatt (ed. ), The vayu purana, part-II, 1st ed., 784—789, tr. G. V. Tagare. In vol.38 of Ancient Indian Tradition and Mythology, Delhi: Motilal Banarsidass, 1988.". Retrieved 10 April 2016. ↑ "J. L. Shastri (ed. ), The kurma-purana, part-I, 1st ed., 47—52, tr. G. V. Tagare. In vol.20 of A.I.T.&M., Delhi: Motilal Banarsidass, 1981.". Retrieved 10 April 2016. ↑ "J. L. Shastri (ed. ), The Narada purana, part-II, 1st ed., p. 699, tr. G. V. Tagare. In vol.16 of A.I.T.&M., Delhi: Motilal Banarsidass, 1981.". Retrieved 10 April 2016.